Graduation card to be personalised. 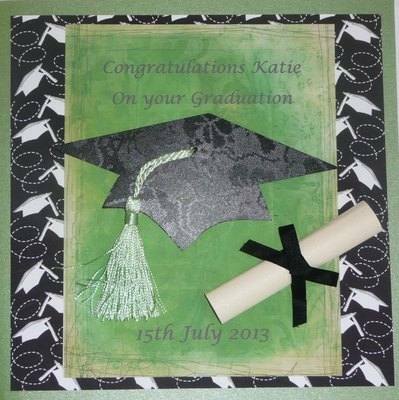 In shades of green and black with graduation cap with lime green tassel and scroll with ribbon, sitting on a black and white graduation cap background. Verse will be as below, if you wish a different verse please contact Sue direct using the form below. After purchase, please use the form below to let Sue know your requirements, or she will email you. As with all photo and personalised cards you will have direct contact with Sue to ensure you receive the card of your choice. Card measures 8x8 (203mm x 203mm) with white envelope. Price includes UK postage. with new opportunities waiting for you. Aim high and have fun doing what you love to do.